Central Oregon Trail Alliance is ready to commit to more outreach in the Prineville community. 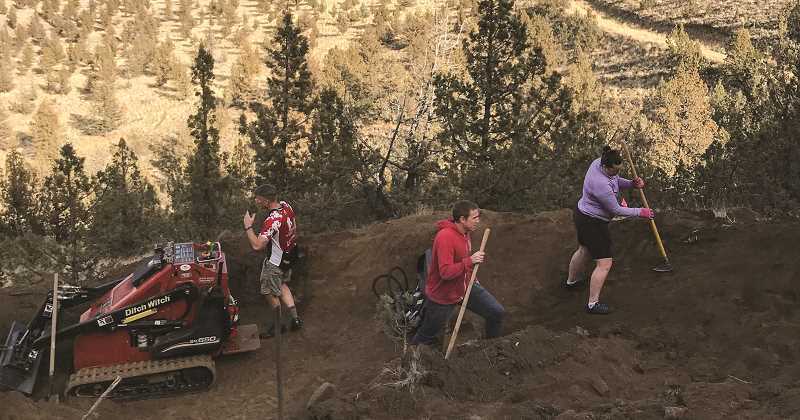 Having participated in and helping complete a handful of local projects — including the Lower and Upper 66 trail systems as well as the Prineville community bike park — members of the regional organization felt now was a good time to connect more with residents. To reach out, COTA is going to start offering a movie night each month. The event will take place every fourth Tuesday evening, with the event scheduled for 7 p.m. at Crooked River Brewing's Pint Size Theater. The first movie night is tonight. "The idea is not original," said Darlene Henderson, a COTA member who has been heavily involved in local trails projects. "Pine Mountain Sports has been doing COTA movie nights in Bend for quite a while. The focus has always been on Bend trails and what COTA is doing in Bend." So the organization decided to import the idea to Prineville, but unlike the Bend version, which requires payment to attend, the local movie nights will be free of charge. "It's a good way to do community outreach," Henderson said. "It gives people an opportunity to become aware of COTA and tell people every month some of the things we have been working on." She acknowledged that while many people may want to get involved in certain projects, they are sometimes reluctant to join an effort out of concern it might require they become a COTA member or regular attendance at meetings. "They want to be involved but they don't want a big commitment because they are busy," she said. "They have families, they have full-time jobs, or they are caring for an aging parent — there are a whole multitude of things. But by coming to a COTA movie night and watching a fun movie and finding out about something that is happening, they might think, 'Oh, I could do that.'" The sessions, which will take place each month through November, will begin with a quick presentation about something related to COTA activities, before launching into the movie. The films, which will be 90 minutes or shorter, will not be your standard Hollywood flick. Instead, they will focus on biking and other outdoor sports. "It is going to be a little more off the beaten path," Henderson said. "Our first movie is the 'The Wizard of Ahhhs.'" Following the opening 1976 extreme ski movie will be another extreme bike rider film, and another planned in the future will be about climbing. "It's not your Hollywood movies. We don't want to compete with the theater," Henderson said. COTA won't sponsor any food or beverages during the movie nights, although Henderson points out that people will have the ability to order pizza or other foods as well as a beer or soda to enjoy during the movie. "It's just a fun way to engage the community in what COTA is doing with no strings attached," she concluded.